Jaynesway Farms is a busy place all year round. Besides our daily activities of offering horseback riding lessons and pony rides, we also support our riders, boarders and customers in a variety of activities including: Horse Camp (Holiday and Summer), Schooling Horse Shows to showcase our riders' skills and abilities, helping scouts earn badges and supporting our boarders who horse show nationwide. A children's summer and holiday camp is offered during June through August (Summer Camp), November (Thanksgiving Camp) and December through January (Holiday Camp). Camps operate Monday through Friday 9am to Noon. Campers learn basic horse care, how to groom and tack and basic riding skills along with crafts and games. Our gentle horses and safety first instructors combine to provide a valuable learning experience for your child, building self-esteem and confidence. Camp fees are $60 per day. Attend one day or multiple days. Campers must be at least five years old. No prior riding experience is necessary. To sign-up for camp, stop by the front office or give us a call at 630-483-1827. CLICK ON THE "CURRENT NEWS" TAB FOR SUMMER HORSE CAMP DATES. Call 630-483-1827 to register. We host Spring and Fall horse shows every year. The shows are available to all students and boarders to demonstrate their riding skills and what they have learned in their riding lessons. The shows are always great fun for the entire family. It is fun to watch the riders compete for ribbons and prizes. Scouting Troops earn their animal/pet badge or pin at Jaynesway Farms. The troops learn about horse care, grooming and tacking. 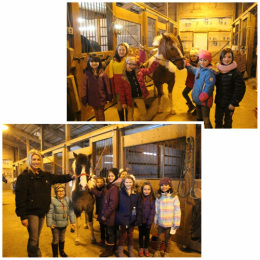 The scouts spend time in the barns with our qualified and knowledgeable staff and our friendly horses. To bring your scout troop to the farm, please call us at 630-483-1827. Jaynesway Farms competes in numerous local and national equestrian events. 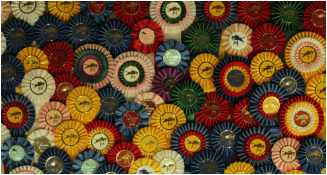 We participate in IHJA Shows, Region 5 USEF, and various local shows (County Fairs, Fox Hunting, Eventing, ISC shows). We also compete in equestrian events in Florida, New York, Pennsylvania, Washington DC, Kentucky, Indiana, and St .Louis.